It was a sunny day in June 2001. I’d just arrived at the University of King’s College in Halifax, Nova Scotia, where I was attending the Authentic Leadership summer program. I was eager to explore, and planned to spend the day wandering the city. Just being in a new place, away from my daily routine, expanded my viewpoint. Like travel always does, it was preparing me to grow. When I returned to the campus later in the afternoon, I stepped into the hushed atmosphere of King’s College Chapel. The interior of the church was bathed in dusky light. Shafts of sunlight slanted through its windows, illuminating dust motes swirling in soft currents of air. I ran my fingertips along the top of the back of one of the old wooden pews, thinking about how many people had done that over the years. I felt a reverence for the sense of time passing in the musty old church, for the people come and gone, and living their lives in one key aspect much like we do now. We all wonder, Will anyone remember me? Will what I have done with my life, matter? A few months earlier, while I was sitting and reading with a friend, I saw an advertisement in a Buddhist magazine for the Authentic Leadership program. The friend was taken aback, surprised at how effortlessly I claimed that experience for myself, even before I knew how I would make it happen. When your soul signs up for a voyage, it’s up to you to set sail and navigate. At the time, I was a team and project manager in a software company. I knew it was a stretch to get approval for leadership training, which was considered a “soft” skill, but I didn’t let that stop me. The program had several different subject tracks, so I chose one that I thought sounded the most business-oriented. When I pitched the program, my manager approved it. I believe that there is a kind of magic at work when your spirit responds strongly to a potential experience. When you really mean it, when you commit to your dream, the universe conspires to help make it happen. On the first day of the Authentic Leadership program, I dutifully attended the track I had chosen. Problem was, I was bored stiff. That evening, Fred Kofman—currently an Advisor for Leadership Development at Google—spoke, and it changed everything for me. His speech about personal and team mastery was pivotal. He understood that when you lead people, you support their growth. This was what my spirit had said “Yes” to. When Kofman began to introduce new ideas and perspectives, I knew that I wanted to attend his track instead of the one I was supposed to attend. The next day and each day afterward, I did just that. Strictly speaking, I was “breaking the rules,” because I had gotten approval to attend a different program track. There have been times in my life when I’ve let expectations like that stop me, and I’ve always regretted it. So, I followed the rightness of it, and it changed my life. Because I “asked for forgiveness later, rather than asking for permission first,” I learned new ideas. I discovered ways to help my team see new perspectives. I grew. Yes, he was talking about creative techniques. But life is creative, and you are creating all the time. Sometimes, you need to create outside the lines. Sometimes, you need to break a rule to grow into who you are meant to be. I’m not suggesting doing something truly wrong; your integrity is sacred. But like all creatives, there is value in knowing when it is okay to break the rules—or bend them a little! Think of a time when you broke the rules to do something that was absolutely right. What did you learn by making that choice? 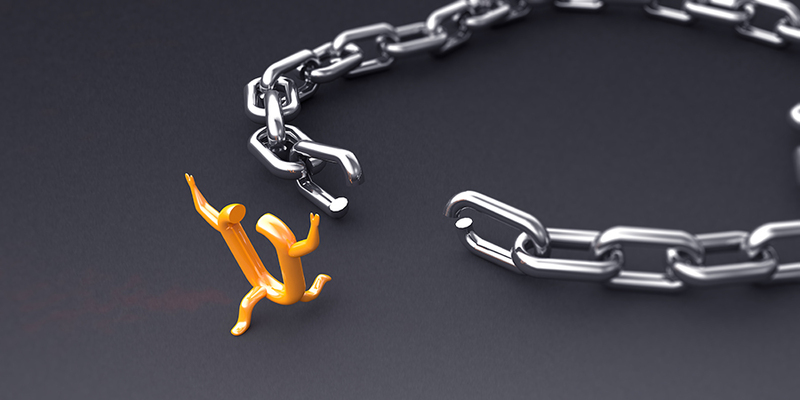 What rules are blocking you now from making real progress on your creative goals? I’m not suggesting you quit your job or stop fulfilling your responsibilities. But it’s not an all-or-nothing proposition. We hear so much about “work-life balance” and “making time” for self-care. We try to schedule it into our lives, sandwiching “quality time” in between deadlines and errands. But what if living your life is not about segmenting it into fragments of everything you are “supposed” to do, then checking them off your to-do list? What if there is a way to live your life more creatively? To be more present, to nimbly respond in the flow of your life? It requires listening to that voice that whispers to move outside of your routine, or beyond your comfort zone. It means following that nudge on your shoulder, pushing you in a new direction. And when that voice or nudge is stronger than usual, pay close attention. You have something you want to create that has been calling to you for a long time. In six months, my retreat in Tuscany begins. If you’re looking for your next creative breakthrough, join me this June. 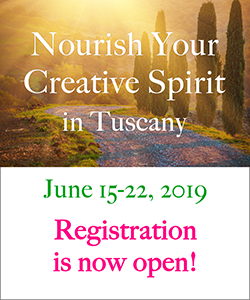 See Nourish Your Creative Spirit in Tuscany for details.